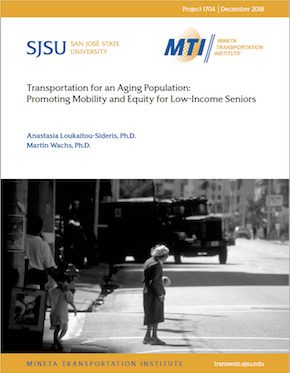 This study explores the travel patterns, needs, and mobility problems faced by diverse low-income, inner-city older adults in Los Angeles in order to identify solutions to their mobility challenges. The study draws information from: (1) a systematic literature review of the travel patterns of older adults; (2) a review of municipal policies and services geared toward older adult mobility in six cities; (3) a quantitative analysis of the mobility patterns of older adults in California using the California Household Travel Survey; and (4) empirical work with 81 older adults residing in and around Los Angeles’ inner-city Westlake neighborhood, who participated in focus groups, interviews, and walkabouts around their neighborhood. Anastasia Loukaitou-Sideris is Associate Provost for Academic Planning at UCLA, Associate Dean of the UCLA Luskin School of Public Affairs, and Professor of Urban Planning. Her area of specialization is urban design, physical and land use planning. She has served as a consultant to the Transportation Research Board, Federal Highway Administration, Southern California Association of Governments, South Bay Cities Council of Government, Los Angeles Neighborhood Initiative, Mineta Transportation Institute, Robert Wood Johnson Foundation, the Greek government, and many municipal governments on issues of urban design, land use and transportation. Her research has been supported by the US and California Departments of Transportation, the National Endowment for the Arts, the Mineta Transportation Institute, the Haynes Foundation, the Mellon Foundation, the Poverty and Race Research Action Council, the Gilbert Foundation, the Archstone Foundation, the California Community Foundation, and the AARP. She has published more than 100 articles and chapters and has co-authored or co-edited five books: Urban Design Downtown: Poetics and Politics of Form (UC Press 1998); Jobs and Economic Development in Minority Communities (Temple University Press 2006); Sidewalks: Conflict and Negotiation over Public Space; Companion to Urban Design (MIT Press 2009); and The Informal American City: Beyond Taco Trucks and Day Labor (MIT Press 2014). Martin Wachs is Distinguished Professor Emeritus of Civil & Environmental Engineering and of City & Regional Planning at the University of California, Berkeley, where he directed the Institute of Transportation Studies. He earlier spent 25 years at UCLA, where he was Chairman of the Department of Urban Planning for eleven years. After retiring from the University, Wachs became the Director of the Transportation, Space, and Technology Program at the RAND Corporation in Santa Monica. He is semi-retired, teaching courses and conducting research at UCLA in transportation policy and working on transportation policy projects at RAND. He is a Research Associate of the Mineta Transportation Center. Professor Wachs published in 1979 the first comprehensive study of elderly suburbanization and their travel patterns and needs, entitled: Transportation for the Elderly: Changing Lifestyles, Changing Needs. Since then he has continued to conduct research and publish works on aging and travel. With funding from the American Association of Retired People he currently is researching travel by poor, ethnically diverse inner city elderly. And in another project he is researching the role of mobility and access in decisions by the elderly to remain in the workforce after “normal” retirement age. Lené Levy-Storms is an Associate Professor in the Luskin School of Public Affairs, Department of Social Welfare and the Geffen School of Medicine, Department of Medicine, Division of Geriatrics, UCLA. She holds degrees in public health and biostatistics. Dr. Levy-Storms research interests focus on the role of social support networks on the health of older adults. She has also studied the relationships in community-based settings among minority elders, focusing on their chronic health needs. Most recently, she has focused on health communication and behavior change among older adults and their caregivers in institutional long-term care settings. Madeline Brozen is the Deputy Director of the Lewis Center for Regional Policy Studies at the UCLA Luskin School of Public Affairs. She holds a Masters of Urban Planning from UCLA. Her research focuses on complete streets and open space, bicycling, and older adult mobility patterns. She has conducted research on open streets events, design innovations in the right of way, and travel behavior. She has received two National Planning Achievement Awards for Best Practice from the American Planning Association and a Federal Highway Administration Exemplary Human Environment Initiative award.